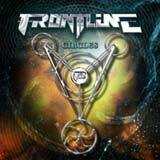 German rockers Frontline are back with their new album, Circles. This is the band's eighth studio album, including 1995's acoustic album and 2003's collection of unreleased tracks). In 1994, the band released their debut album, State of Rock. Rightfully so, this album is heralded as a classic by many in the melodic hard rock world. Still, the band has steadily been releasing albums over the past decade, but to little attention outside of their homeland of Germany and rock/metal hungry fans in Japan. That's too bad, because along with Fair Warning and Bonfire, Frontline is one of my favorite German hard rock acts. Circles sees the band make some changes to their sound. Don't get me wrong, this is still the Frontline brand of hard rock we're talking about here, but this time it comes with a bit of a twist. The lyrics and music itself is much more melancholy and dark than before. The happy and upbeat theme that dominated most of the past albums is barely present on this album. Instead, the lyrics on this album deal with painful and sad emotions, with the music taking on a much darker and heavier atmosphere. The guitar work on this album takes on a harder edge, with the riffs in particular heavier and more aggressive than before. Also, the soloing seems a bit more adventurous on Circles. This aspect of the sound brings Frontline's sound a lot closer to metal than the AOR-ish leanings of the past. From a production standpoint, the guitars have been tuned down a bit (but not to nu metal and modern rock sounds) to help deliver the darker atmosphere the lyrics on this album demand. As with any Frontline album, strong and memorable melodies, accentuated by keyboard textures are a key part of the sound. That's still remains true on Circles, but again, from a slightly different angle. The melodies won't jump on you as quickly as the band's past work, but instead they need to be absorbed over several listens. Also, the keyboards are lessened on this album. Instead, I hear a lot more activity in terms of guitar solos and some shreds scattered about. Also, the dark atmosphere of the album really does not call for the use of keyboards nearly as much as previous cuts from the band. As I mentioned before, the guitars have a bigger presence on this album, giving them a heavier edge than I ever expected from this band. Even though there's absolutely nothing original about the sound of Circles, Frontline knows how to write and perform quality songs. While the songs don't jump on me nearly as fast as older Frontline songs, I'm finding that there is a lot of emotion and interesting musicianship throughout the album to provide it with long term lasting value. Stephan Kämmerer's voice still powers along through the songs with his melodic, smooth, and high pitch tinged delivery. During some of the darker moments (such as in I Gave You The Rest), he does add some unfamiliar harshness into his voice, but again, this completely fits the darker vibe of the songs. I'll be the first person to complain when a band changes its sound and I don't like the change (see Def Leppard). In this case, I do think than Frontline have successfully refreshed themselves without forgetting who they are and where they came from musically. Circles is a hard rock album firmly based in the sound of 1980's melodic hard rock, but still sounding very relevant in the 21st century. Die hard fans of AOR or of the band's classic sound might be put off by this album, but fans of hard rock in general will certainly find a lot to like here. Despite what I said above about the songs jumping on you with time, I think maybe 1 or 2 true killers that stand out instantly would have made this album better. Still, I'm quite satisfied with this album.